This is such a fresh and easy no cook salad and is inspired by the Food Matter’s Project. I chose to use cauliflower that has been “riced” in a food processor instead of using the traditional bulgur. Bulgur is a type of cracked wheat and is considered a whole grain. But in our recent quest to give up gluten, I used cauliflower as a stand in for grains and DAAAANG it’s good. The fresh herbs and lemon make this a perky salad that is perfect for taking to a picnic, potluck, or for a labor day cookout!!!!! Get on it. 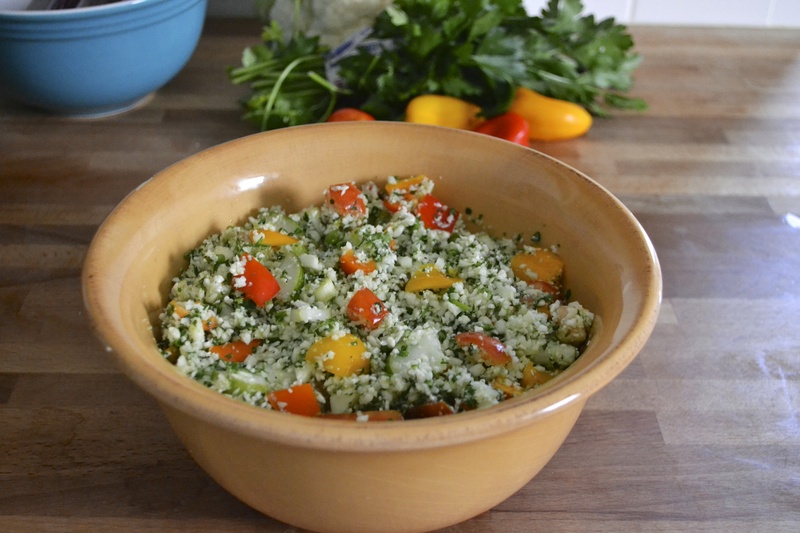 Thanks to Sarah of Simply Whole Kitchen for choosing the Tabbouleh recipe for this week’s edition of Food Matters Project. So a small explanation on why we have gone gluten free…. For most of my husband’s life, he has been plagued with the worst seasonal allergies. He should be the Bubble Boy. He was getting shots weekly until it became too costly, but then the weekly doses of Allergra D weren’t much cheaper either. Migraines soon followed, nearly once a month…sometimes two or three a month. They were debilitating and vomit-inducing. Appetizing, I know. Months ago, he eliminated grains and dairy from his diet, choosing a “paleo” life-style (only eating meat, vegetables, fruit, and nuts and eliminating grains, dairy, legumes). Since going “primal”, I have been amazed at all the positive aspects. His allergies? Vanished…his migraines? GONE. It was a miracle. His allergies were the result of inflammation caused by sensitivities to gluten, grains, and dairy. Seeing his amazing transformation, I soon began to wonder if gluten was having an affect on me too. I recently dived into gluten free living and have found that I feel a lot better when I do not consume wheat products. 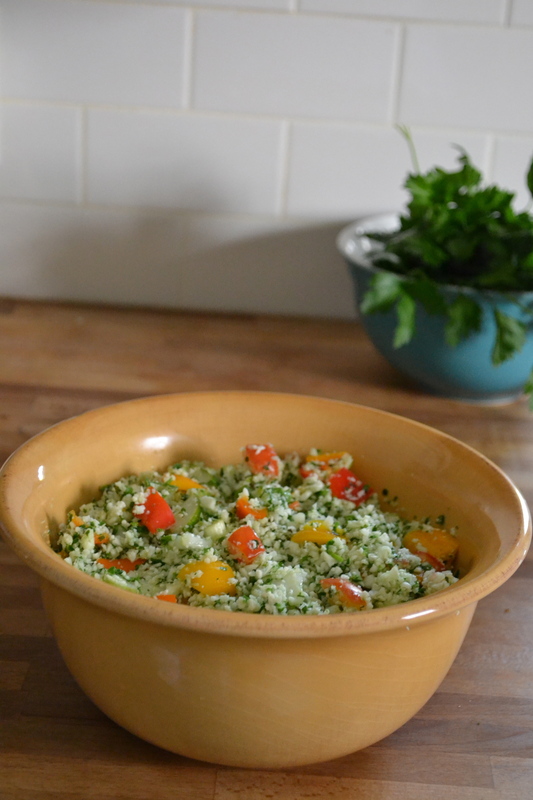 Soooooooo, whether you have gluten sensitivities or not, I guarantee that you will enjoy this gluten and grain free tabbouleh salad during the final day of a great long weekend. Get out your food processor…don’t have one? I recommend investing in a good one because mine is my best friend! Sorry Guinness. Cut the cauliflower into 1/2-inch to 1/4 inch pieces before adding to the food processor. Add diced cauliflower to food processor bowl. Pulse until the cauliflower resembles rice. 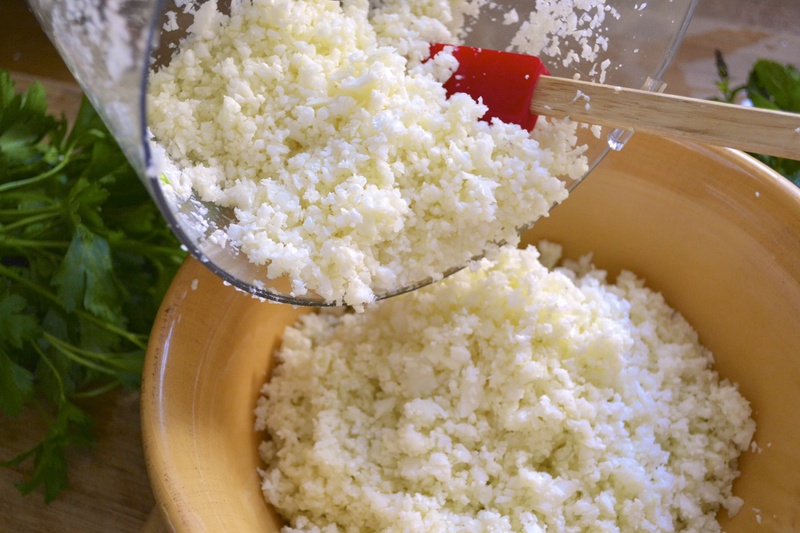 Scrape the “riced” cauliflower into a medium bowl and set aside. May need to do this in batches to ensure that all of the cauliflower is evenly “riced”. In the bowl of the food processor (no need to clean out) add packed parsley, mint, kale leaves, lemon juice, and olive oil. Process for about 1 minute. Add herb mix to the riced cauliflower. Gently stir to incorporate. Add the remaining ingredients (tomatoes, cucumbers, diced peppers, scallions) to the cauliflower-herb mixture. Gently stir to combine. Season with salt and pepper to taste. What a cool idea to “rice” the cailiflower! I will definitely try that too. It is the best trick!!! Healthy and low carb and über tasty. oh my gosh – what a great idea! I’m attempting to eat less carbohydrates now too so this is a perfect recipe for me to try! I’d love to have some in the fridge at all times for a quick snack. Thanks Alissa, oh and BOOMER SOONER! Hope to see you at a game or two or three. Cauliflower is the ninja food! Ya we hope to get down there soon. Glad to hear that you’re feeling better. I never thought to use the cauliflower in that way- but now cannot wait to try it out! This looks delicious!